This blog began with the challenges of a reactive dog. Some day I'll tell you the story of when Ruby's reactivity first appeared and how I spent a lot of time blaming myself and the choices I made for it. Today I'm here to tell you that Ruby is still - will always be - a reactive dog, but how mostly it isn't an issue anymore. It isn't an issue not because I am not constantly managing it and making decisions around Ruby's reactivity, but because it doesn't define us, and because if there is one thing you can count on, it's change. Ruby has softened and sweetened before my very eyes, daring me to be less afraid and to trust her with things that were previously out of our comfort zone. Let me be clear: Ruby is still a maniac on the leash when she sees other dogs or bicycles, but if I time it right, I can significantly reduce the severity of her reaction by simply picking her up. Since I wrote this post, Ruby now looks to me whenever she is uncomfortable or in need of some reassurance to scoop her into my arms. I'm lucky she's small enough to do so, and I don't think it's a cheat or a sign that she's spoiled - it's simply what works for us. Recently I took Ruby and Boca to visit our dear friend at her farm on the prairie, complete with three dogs, three cats, a herd of horses, donkeys, goats and llamas and a flock of ducks - a veritable menagerie of triggers, right? Not to mention that first we had to get there, in the car. I solved Ruby's car-barking by getting her a crate for road trips, but the unfortunate trade-off is that riding in the crate exacerbates her car sickness. I decided to compromise by leaving the mesh door unzipped so that she could come out of the crate on her own once we set off. Ruby exited her crate by the time we reached the freeway, and soon there was a motorcycle in front of us - one of her triggers. I glanced back to confirm that yes, Ruby definitely saw the motorcycle. And didn't bark. We saw two more on our round trip - still no barking. Best of all - no puking! Boca was not thrilled to give up part of the seat and eventually curled up in the snug travel crate - an amusing sight. Four ginger dogs and one black dog romped around my friend's yard for hours and tried their luck with several disciplinarian cats. Ruby got her fill of barking at real-life horses and made a new terrier friend (a fellow Jack Russell mix with whom she exchanged hilariously spastic play-bows) all without incident. It was a glorious day for everyone. Another small win this month was that I was able to comb out the mats in Ruby's increasingly long Border Collie-esque pantaloon feathers (technical term). She used to be afraid of the comb, and suspicious of most grooming activities. Now she accepts nail clipping, paw massages and feather-untangling. She wags her pretty paintbrush tail more, in wide sideways sweeps. She lays upside down and makes adorable blissful grunts and implores me to scratch her armpits. These changes are evidence of the growing security she feels, and it makes my heart soar to see her breathe a little deeper, settling into her own skin and the life and routines she can feel safe within. One of my goals for Ruby and I this summer is to take her on a solo backpacking trip. This will come with its own challenges - like swiftly scooping her up if I need to with a 30 pound pack on my back- but I believe the memories and experience it will entail outweigh the hurdles. Last night my boyfriend and I did a test-pitch of my new tent - a bright yellow, crinkly, novel object - and much to my delight and surprise, as soon as the door was unzipped, my (not so) timid little red-and-white dog climbed right in! Ruby is ready for new adventures, and a constant reminder that we are always evolving, that curiosity can overcome fear, and that who we are is never limited by who we were. I am so proud of you two (plus Boca). Both for how far you've come on your journey so far, and for that final sentence. Very well said. Thank you so much, Chris! Ruby has been such a gift in all she has taught me. And Boca, as my aunt says, is like soothing chamomile tea! That is so awesome. I have a highly reactive dog - a little Morkie/Havanese/Who knows what we adopted at age 6 from The Dumb Friends League. He's a cutey pie but who knows what he experienced in his first 6 years. We worked with a trainer, learned a lot and acknowledge that some "bags" will never be unpacked. And that's ok. He's not perfect; who is? We know how to work with him, what helps him (and us) and have accepted "that's just our dog." We are all more relaxed now that we stopped trying to fix everything. Bravo to you and your progress with your pup! I enjoyed reading this! This is so wonderful! Thank you for sharing it. It gives all of us with reactive dogs hope. I've seen Luke relax in more circumstances lately, though we still have a long way to go (the grooming handling and nail trimming being a big thing to overcome). Please please please tell us Ruby's story!!! I'm in the same predicament and desperate to find ways to stop my dog being reactive to people dogs and more. She is a rescue and we can't even enjoy a walk without an incident. I don't want her to be stuck at home and miss out but she seems stressed out on walks and over stimulated. I want to cry. Unknown: 1) take a deep breath. There are now a LOT of great resources for those of us with reactive dogs. 2) check out Lara's tab above, titles "My Reactive Dog". She has some great links there. 3) Sign up for a reactive dog class at the Fenzi School of Dog Sports (https://fenzidogsportsacademy.com/index.php/courses/dog-behavior-courses) such as "Dealing With The Bogeyman" and "Management for Reactive Dogs". These are excellent on-line courses with great instructors. 4) Many of the links in Ruby's Reading List (sidebar on right) are to blogs about reactive dogs. They will lead you to other good resources. 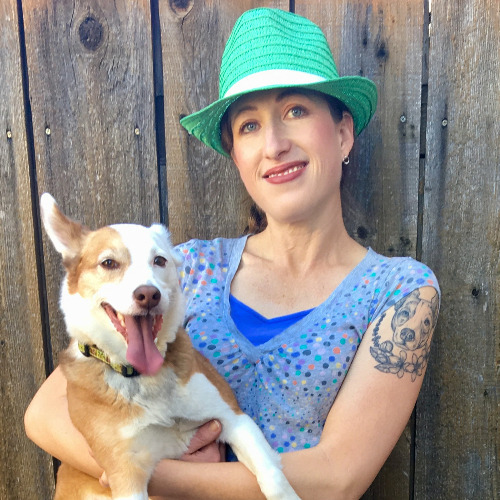 One of the best: Dr. Jen's Dog Blog (Dr. Jen is a veterinarian specializing in behavioral issues; her blog explains things exceptionally well). 5) Be careful when you look for a local trainer; some are excellent with reactive dogs and some preach the discredited 'dominate them and be the pack leader' approach. Usually Karen Pryor-trained trainers (KPA-CPT certified) are a good bet. Find the closest ones to you at https://karenpryoracademy.com/find-a-trainer/#!directory/map.